The cost and size of today’s student loans are the subject of dinner table discussions across our nation because without congressional action interest rates on federally subsidized student loans will increase on July 1. As is often the case with bread-and-butter issues such as the cost of college education, the size of education debt and the potential for higher debt payments warrant the increased public attention. The most recent data on outstanding education loans during the Great Recession of 2007-2009 reveal that in both good and bad economic times the cost of a college education only increases, as does the debt burden of borrowers. The number of borrowers and the typical loan amount grew amid the most recent economic and financial crisis. This is especially stunning since the expansion of education debt occurred at the same time that other credit markets, especially mortgages and credit cards, contracted. Households went deeper into education debt during the crisis as other forms of credit became less prevalent. The result is even less economic security today for those who went deeper into debt to pay for their education in those years. The numbers tell the tale. The Federal Reserve conducted a survey of the same group of households in 2007 and 2009 to paint a comprehensive picture of household assets and debt during the financial and economic crisis. 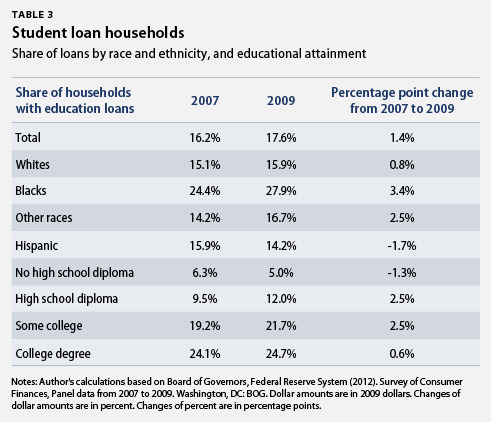 This data set contains information on education debt—all private and publicly subsidized installment loans that the household has taken out to pay for education—in addition to other crucial variables, such as the household’s age, income, total wealth, total other debt, and race and ethnicity, among others. The underlying household data was released in April 2012 and are thus the most recent data with this level of detailed household information. The financial and economic crisis of those years marked a period of widespread declines in household debt levels. Mortgages and credit cards declined as households repaid their debt and banks foreclosed on bad debt. But the same was not the case for education loans. Education loans typically cannot be discharged in bankruptcy, which may explain why education debt didn’t fall like other forms of debt did. But there are other factors at work, too. The summary data illustrate that education loan borrowers became economically less secure during the crisis because they had more debt—education and noneducation—after the crisis than before. There were also generally more households with education loans and the amount owed on education loans went up during the crisis. The drop in wealth among education loan borrowers resulted in part from more noneducation debt, even though debt in the overall economy went down during this period. 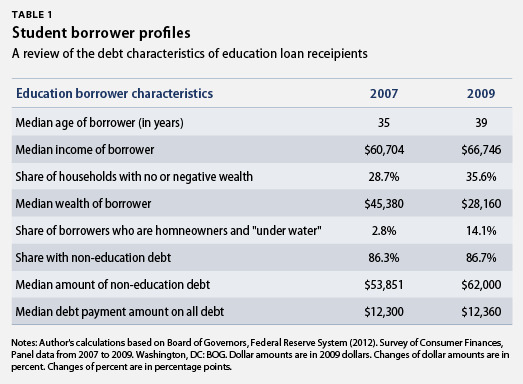 The median noneducation debt amount of education loan borrowers increased from $53,851 in 2007 to $62,000 in 2009. (see Table 1) One possibility for this trend is that those who owed education loans were still more likely to have a job or get a job than other households, and thus they were more likely to access the more limited credit markets. Other factors made it harder for households to get out of the deepening economic security hole. Borrowing households, for instance, had less time to recover their wealth losses as the median age of education borrowers went from 35 years old in 2007 to 39 years old in 2009. This could mean that older households borrowed more education loans to pay for additional education to get a leg up in a tougher labor market. Debt payments grew at about the same rate as income, even though interest rates fell during the period. Households had additional incomes, but their growing debt levels limit the benefit of those additional resources as rising interest rates could quickly take a bigger bite out of incomes, making it harder for households to recover the economic security lost during the Great Recession. The median amount owed by borrowers also grew during the Great Recession. The median education debt amount increased by $2,573, from $12,427 in 2007 to $15,000 in 2009. And almost all groups of households saw rising education debt levels, except for households without high school degrees. 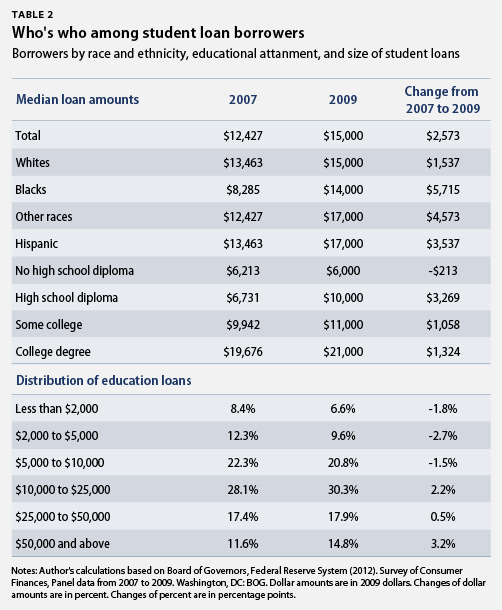 The largest increase in the median education debt amount—$5,715—occurred among African-American households. Households of other races and households with a high school degree also saw comparatively large increases in education debt. That is, households that disproportionately struggled due to higher unemployment, lower wages, and fewer benefits than their counterparts, such as African Americans, saw faster debt increases than their counterparts. It is possible that struggling groups were more willing to go deeper into debt than their counterparts in an effort to regain some economic security during the difficult labor market during and after the Great Recession. The summary data show that rising education loans put many student loan borrowers, especially vulnerable households, into an economic bind, making it more difficult to climb out of a deepening hole. 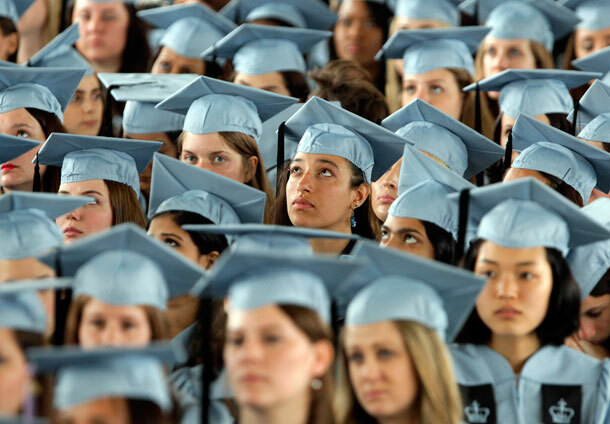 Allowing interest rates on new student loans to climb without countervailing measures will thus put additional pressures on an increasingly struggling middle class that continues to need to borrow to attend ever more costly colleges and universities. Christian E. Weller is a Senior Fellow at the Center for American Progress and an associate professor, Department of Public Policy and Public Affairs, at the University of Massachusetts Boston. The Federal Reserve conducted its regular triennial Survey of Consumer Finances, or SCF, in 2007. The Federal Reserve contacted the sample of households from its 2007 SCF in 2009 for a reinterview to capture the effect of the worst recession since the Great Depression, and almost 90 percent of households participated. The result is a unique, nationally representative panel data set that captures the crisis’ impact. The Federal Reserve Bank of New York publishes another data set, which offers data with much less detail on the borrowers, but is available each quarter. See Federal Reserve Bank of New York, “Quarterly Report on Household Debt and Credit,” (2012). All dollar amounts are in 2009 dollars. The median is the data point that splits the number of observations, in this case households, exactly in half. The data in Table 3 showing the distribution of education loans by size also show that education loans above $10,000 grew, while the share of education loans below $10,000 shrank between 2007 and 2009. That is, the rise in the median loan amount was driven by rather widespread growth of education loans in the upper 60 percent of the loan distribution.